As we were moving light speed ahead towards Zion's 3rd Birthday last month I knew it was getting close to time to move forward with potty training. She has had a little pink princess potty since she was about 18 months old, which she has used several times but more out of novelty than anything else. Despite a little bit of prodding from well meaning family members, I waited until I felt Zion was really ready to make the transition. And truth be told, until I was in a place where I could devote my full time and attention to the process as well, hopefully with as little frustration as possible. Since we have been in Alaska on an extended business trip since February, I was most concerned about what the right approach would be and how to minimize accidents - especially since we are staying in an extended stay hotel, and I would be mortified to have stains from accidents everywhere! I also knew that I didn't really want to purchase another potty seat that would then require additional transitioning to the big seat. I set out to purchase the supplies we needed, finding everything on my list at the local Target. I opted for a potty seat that you can place directly on the toilet, and had Zion with me to pick out the design. She, of course, picked out the princess one. I was happy that it came with a Potty Hook, which is a great invention that allows you to hang up the seat on the side of the toilet after use. We also picked up a small stepping stool, flushable wipes, training pants, and big girl undies. My strategy was to take the best ideas from a few of the several popular training methods and turn them into a system that would work for us. While I loved the concept of the 3-Day Method, having Zion run around naked in our hotel room (and having accidents on the floor) sounded like it wouldn't be fun for either of us, not to mention they suggest having a portable potty in every room. I did however like the idea of a quick turn around. I also felt like some of the other very gradual approaches just prolonged the experience. I decided that we would start out by having Zion try to go frequently - essentially watching for signs she needed to go and not waiting more than 30-60 minutes between tries. I was surprised at how quickly she started to get the idea. We planned on using the training pants on days when we'd need to be out running errands, and use big girl undies whenever we were at home. I honestly believed she'd be in training pants overnight for an extended period of time - mostly out of fear of her having an accident in the hotel bed. I learned quite quickly that the training pants were too similar to diapers and the more Zion wore them, the less she was concerned about accidents happening. Instead of trying to convince her, I just decided to stay close to home and only keep her in underpants. After a couple of accidents, I'd say less than 5 honestly, she began to run to the potty whenever she got the urge. During naptime and bedtime I was still very reluctant to allow her to sleep without wearing a training pant. After several nights in a row of Zion waking up with dry training pants I believed she may be ready to eliminate the training pants all together, but I have to say, I knew in my mind the minute I took them away she would have some awful accident in the hotel bed - one that I would be mortified to clean up and have the housekeeping see the next day. Just being honest! I was a bit anxious and stressed out about it so I delayed. 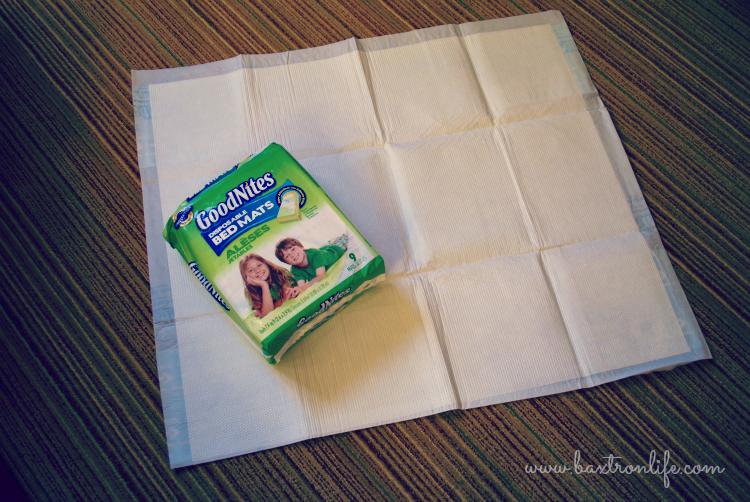 Then I learned about the GoodNites Disposable Bed Mats that Target sells! These mats can go right on top of the sheets and they have adhesive tape on the backside to keep them in place, so I don't have to worry about them bunching up - which is key with our very active little sleeper. As for size, they are perfect for generously protecting a good chunk of a toddler or twin bed. You could of course, use two to cover a greater area, especially if you have a very active sleeper like we do. 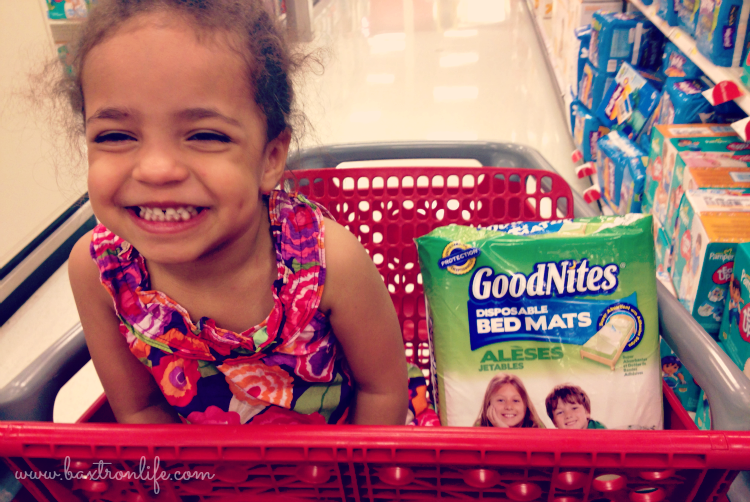 If you want to try them, make sure you grab this coupon to save $1.50 on a package of Target GoodNites Bed Mats. The peace of mind they bring is well worth it! I am happy to report that Zion has not wet the bed once since we gave up the training pants, we are super proud of her for that. And when the inevitable does happen, we will be ready for it. In the meantime, I don't have to be anxious or worried about it, because the bed is protected and will be easy to clean up if and when it does happen! If I were to offer any tips for potty training it would be to wait until they are ready, and you are ready too! Figure out what strategy or approach is going to work best, and keep in mind your child's unique personality and learning style. Make sure you dedicate your time and attention to the task at hand and really partner with your child to make it a fun rite of passage. 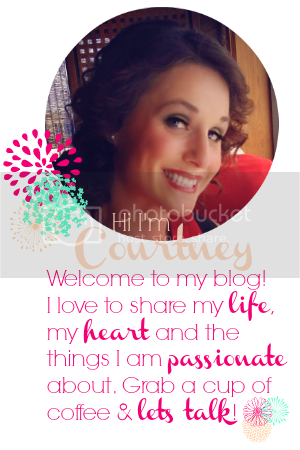 Use tons of positive reinforcement! 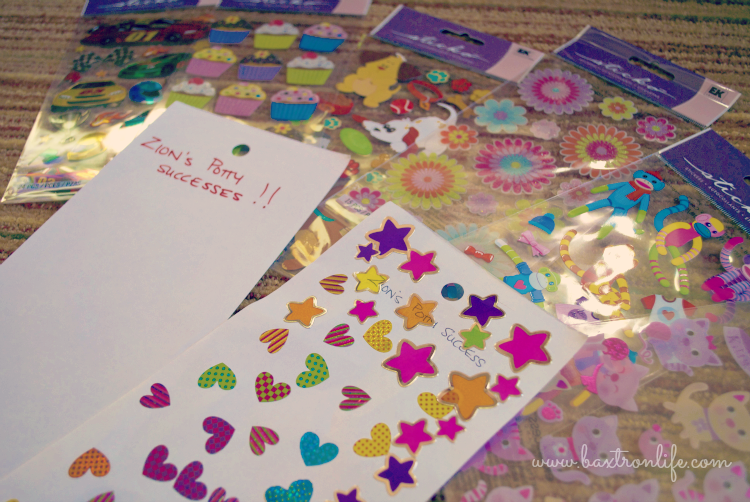 Zion loves working towards a reward and so we took her to pick out fun and colorful stickers to fill out simple charts. Initially she got big rewards for little successes, but as her confidence grew, we upped the requirement for the rewards. Now she earns stickers every time she uses the Potty, but she has to turn in several filled charts to earn a special reward - often an outing to a place like Chuck-E-Cheese or a special date with Daddy. 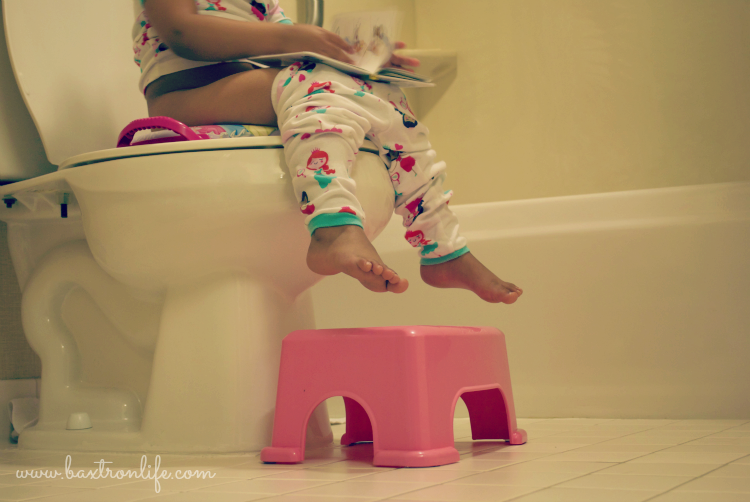 What potty training tips worked for you? 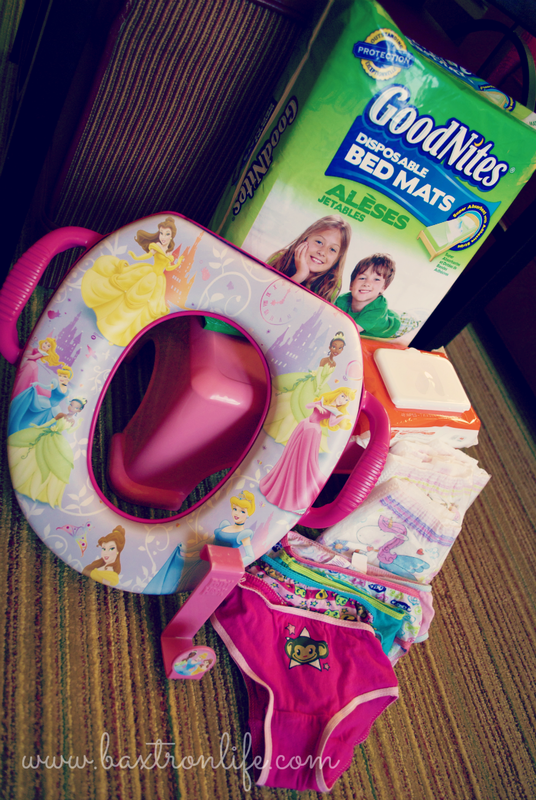 What are your must have items for peace of mind in potty training? Will definitely try these tips... Aiden is completely dry over night and can recognize his potty signs but refuses to go on the potty.